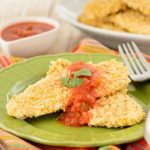 Mexican Turkey Cutlets are full of flavor and a lighter meal option. They are baked with a crunchy coating of corn tortilla chips and served with salsa. Preheat oven to 400°F. Place a wire rack in a rimmed baking sheet. Whisk together eggs, water, cumin, and garlic. Dip cutlets in egg mixture then dredge in crushed chips. Place coated cutlets on wire rack. Bake for 15 minutes, or until cooked through (no longer pink in center and 165°F internal temperature). Use baked tortilla chips for a lower-fat option. Use your favorite flavored tortilla chips to customize the flavor to your preference.